Pittsburgh is full of chic patios for dining and living, and rooftop patios are all the rage. Plus, it seems like even chicer are trendy concept collisions especially when animals are involved. In Lawrenceville alone there is the Black Cat Market that encourages cat visits while enjoying coffee, and Eat Drink Pittsburgh recognized Grounds and Hounds, also in Lawrenceville, for their unique blending of canine care and coffee as well. But McKees Rocks serves as the area behind the dog on a hot tin roof? 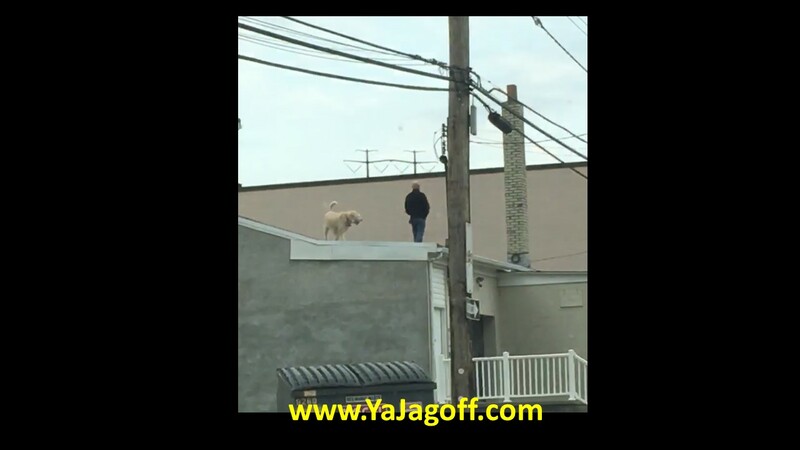 Perhaps newest chic collision, you know, roof walking with dogs. Really? Okay so patios are cool, roof patios even cooler, pairing animals with cool things is the coolest right now, but this? Come on…..is it the need to be chic or cool or is there an invisi-fence on that roof? Either way it is really pushing the chicometer! Dogs=cool, patios=cooler, rooftop patios=reaching new cool heights, but dogs on roof tops on slabs of wood in the back of a building, not so much. Pittsburgh already has its fill of chic concepts and this isn’t one of them. The Steelers Now Have Michael Vick! The Eternal Turn Signal – CAPTURED ON VIDEO!! !